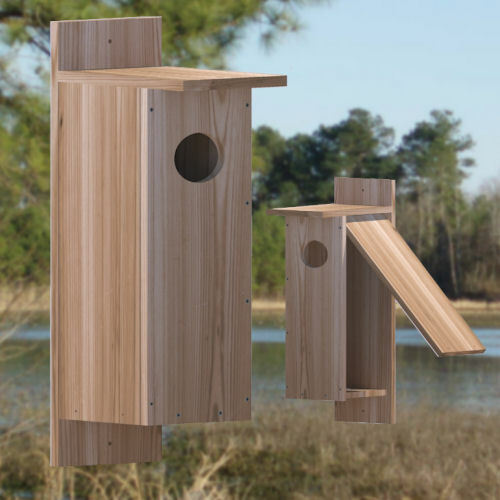 Specifically designed for the American Kestrel. 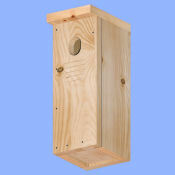 Box size and entry also suitable for Screech Owls. Style: Front opening, bottom pivot, flat roof. Floor area: 78.625 sq. in. 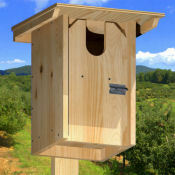 ; drop: 9 3/4"
Free nestbox plans for owls, ducks and other large cavity-nesters. Plans are in pdf format and require Adobe Reader (also free). All plans/links will open in a new browser window. To view plans, just scroll down, or select a category from the list at left. 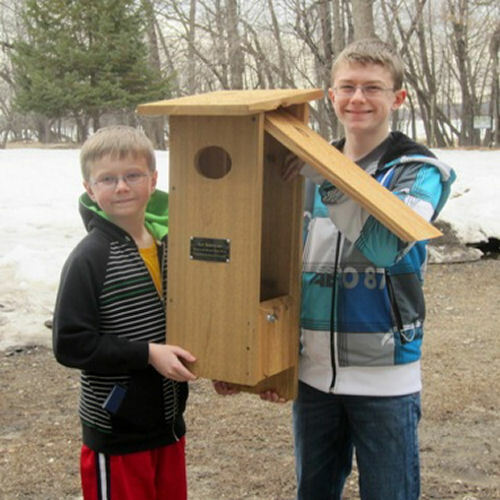 Left click on nestbox thumbnails for larger view. At nest level: On boxes with angled fronts (e.g. Peterson) the floor area is calculated at 2 1/2" below bottom of entry. This comprehensive 31-page plan was prepared by Charles G. Wade, Lee Pauser, and David Altknecht and includes construction photos, mounting advice and general information on the Barn Owl. Plan includes a full-size template for cutting the oval entry. 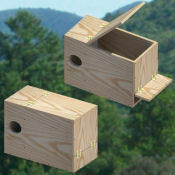 Lumber: 4 x 8 x 3/4" exterior plywood (makes two boxes). Designed by Wood Duck Society director Don `The Duckman' Helmeke. Don's design was published in the Minnesota Waterfowler, a publication for members of the Minnesota Waterfowl Association. Side access for easy cleaning and observation. 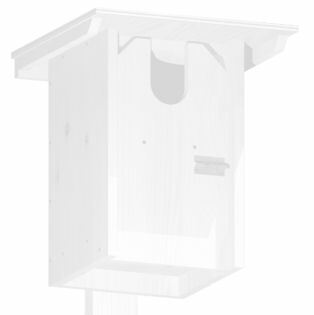 A new CAD-drawn plan of Allen Bower's original Flicker nestbox design. Considered the gold standard of flicker boxes. Numerous saw kerfs on interior help birds to hang vertically in cavity. Side opening, top pivot, flat roof. Floor: 47.7 sq. in. Drop: 18"
Lumber: 2 x 10 (1 1/2" x 9 1/4") x 10 feet long. Box is heavy: 28 - 30 lbs.